The latest offer by the NBA owners to the players has officially been turned down by the NBA Players Association. Furthermore, Billy Hunter, the executive director of the NBA Players Association, said that the players union is likely going to disband. 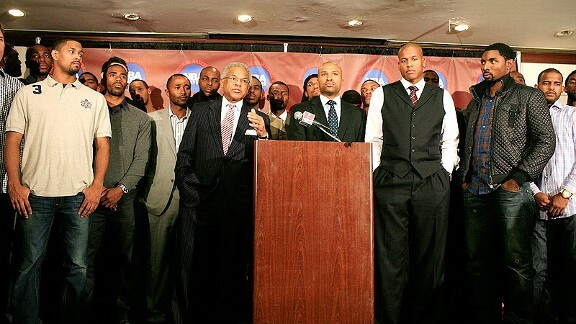 It is more than likely that the entire 2011-2012 NBA season will end up being canceled. Members of the union also plan to sue the NBA based on antitrust laws. According to Hunter, “As of this moment, we’re going to be in the process of converting the NBA Players Association into a trade association.” Hunter went on to say that after working with the owners for two years and that the players have given enough. Add to that the fact that the latest offer by the owners is an ultimatum and that players were definitely feeling disrespected by the offer and it is no surprise the players are done negotiating. The deal offered was a 50-50 share of income, but the players are not pleased with new rules and regulations holding back how teams can sign players.